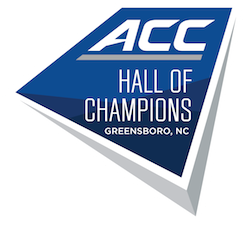 The ACC Hall of Champions is located at the Greensboro Coliseum Complex. For visitor information including local hotel, restaurant and attractions information, please go to the Greensboro Area Convention & Visitors Bureau official website. From I-85 North take (Exit 120A) to access I-85 Business North. Continue on I-85 Business and take (Exit 35B) onto U.S. 220 North until it becomes Freeman Mill Road, and then turn left on Coliseum Boulevard, turn left on Ellington Street and right into main entrance. From U.S. 220 North/Future I-73 to Greensboro until it becomes Freeman Mill Road. Continue on Freeman Mill Road, then turn left on Coliseum Boulevard, turn left on Ellington Street and right into main entrance. From U.S. 421 North take I-85 South (Exit 197) to U.S. 220 North/Future I-73 (Exit 122A) until it becomes Freeman Mill Road. Continue on Freeman Mill Road, then turn left on Coliseum Boulevard, turn left on Ellington Street and right into main entrance. From I-40 West/I-85 South follow I-40 West to Freeman Mill Road (Exit 218B). Continue on Freeman Mill Road, then turn left on Coliseum Boulevard, turn left on Ellington Street and right into main entrance. From U.S. 29 South/U.S. 70 West merge onto I-40 West to Freeman Mill Road (Exit 218B). Continue on Freeman Mill Road, then turn left on Coliseum Boulevard, turn left on Ellington Street and right into main entrance. From U.S. 220 South, merge right onto Westover Terrace, continue on Westover Terrace until it becomes Aycock Street. Continue to Lee Street and turn right onto Lee Street. 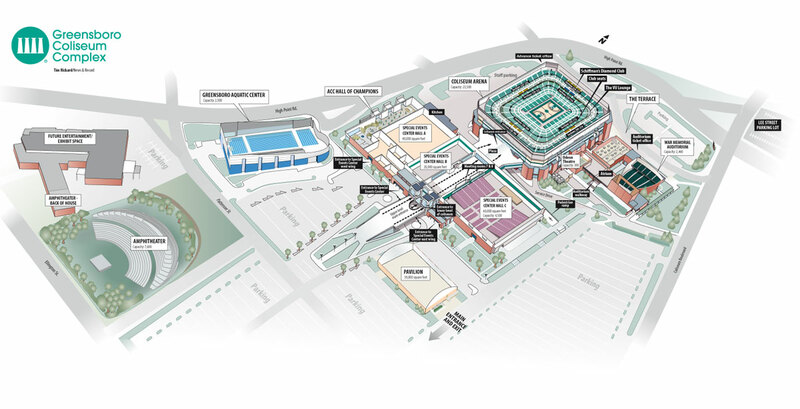 Turn left on Coliseum Boulevard, turn right on Ellington Street, and right into main entrance. Travelers arriving by air at Piedmont Triad International Airport (PTIA), travel east on Bryan Boulevard and take the I-40 exit (Raleigh/Winston-Salem) to Future I-73/I-840. Take future I-73/I-840 to I-40 East (Exit 1). Travel on I-40 East to Freeman Mill Road (Exit 218B). Continue on Freeman Mill Road and then turn left on Coliseum Boulevard, turn left on Ellington Street and right into main entrance. Street, and right into main entrance.